Democrats did not have as strong a performance in races for the United States House of Representatives last week as they did in the contests for the Senate and the presidency. Instead, Republicans retained control of the chamber. But Democrats did regain some ground in the House. Although several races remain uncalled, Democrats would wind up with 201 seats in the House if all races are assigned to the current leader in the vote count – an improvement from the 193 seats Democrats held after the 2010 midterm elections. That would leave Democrats needing to pick up 17 seats to win control of the chamber in 2014. Although 17 seats is not an extraordinary number, both historical precedent in midterm election years and a deeper examination of this year’s results would argue strongly against Democrats being able to gain that many seats. There is also reason to suspect that Democrats are unlikely to sustain the sort of losses in the House that they did in 2010. But odds are that the electoral climate in 2014 will be somewhere between neutral and Republican-leaning, rather than favoring Democrats. In midterm election years since World War II, the president’s party has lost an average of 26 seats in the House, as shown in the chart below. The president’s party gained seats only twice, in 1998 and 2002. The chart details a few other pieces of information that seem to have some influence on the magnitude of gains or losses for the president’s party. First, there is some reversion to the mean: a party tends to lose more seats in the House when it has more of them to lose. There is also another type of reversion to the mean that is often overlooked: the president’s party tends to lose more seats in the midterms following years when it performed very strongly in the presidential race. For example, the large margins of victory achieved by Dwight D. Eisenhower in 1956 and Lyndon Johnson in 1964 were followed by large losses in the House two years later. This may seem counterintuitive: doesn’t a party that wins the presidency by a wider margin have more of a mandate and get more slack from voters? But what we observe in the data, instead, is a “reverse coattails” effect. When a party wins the presidency by a large margin, it usually benefits from voters who are mainly interested in the presidential election itself, and then vote for the same party in races down the ballot. These types of voters may not show up to vote in midterm years. Thus, the more a party benefits from presidential coattails in the presidential election year, the more it stands to lose two years later. The chart also lists an economic variable: the growth in nonfarm payroll jobs over the first two years of a president’s term, as measured from the January in which the new president is inaugurated through October of the midterm election year. The relationship between economic performance and a party’s performance in the midterm elections is somewhat more tenuous than it is in presidential election years. In 2002, there was a decline in jobs early in George W. Bush’s term. However, Republicans actually gained seats in the House that year. In 1994, by contrast, job growth was robust, but Bill Clinton’s Democrats lost 54 seats. The economic relationship registers as being more meaningful if one controls for other factors, like the party’s margin in the presidential race and the number of seats it controlled before the midterms – or if one excludes years, like 1974 and 2002, that may have been affected by one-off contingencies (Watergate and the Sept. 11 attacks, respectively). In addition, there may be relationships between which party controls the House and how the economy affects the midterms. If one party controls both the presidency and Congress, it may receive more credit or blame for the economy than when control is divided, as it is now. 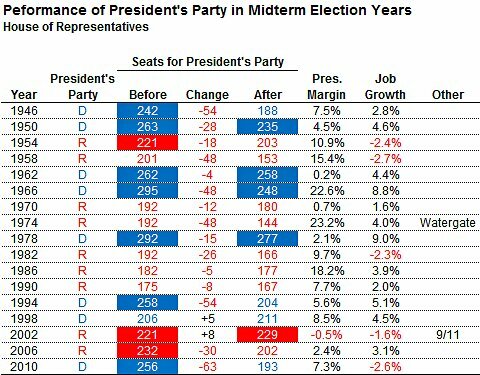 Midterm losses for the president’s party have been somewhat more modest in recent years than during the middle part of the 20th century. This potentially reflects the fact that more Congressional districts have strongly partisan makeups now, leaving fewer seats in play. As 2010 demonstrated, however, no firewall is all that robust in the event of a wave election year. That Mr. Obama won the presidency by a relatively narrow margin this year and that Democrats do not control the House would argue against a wave election this year. Still, the more likely situation is losses rather than gains for Democrats, based on the historical record. And a 17-seat gain would strongly defy historical precedent. Nor did Democrats come especially close to winning the House in 2012, once one examines the results from individual races more carefully. This year, there were only 11 House seats that Democrats lost by five or fewer percentage points. Thus, even if they had performed five points better across the board, they would still have come up six seats short of controlling the chamber. In other words, Democrats would have to perform quite a bit better in House races in 2014 than they did in 2012 to win control of the chamber – when usually the president’s party does quite a bit worse instead. One should never say never when it comes to forecasting the outcome of an election two years in advance. But it might take a major scandal in the Republican party, or for Republicans to splinter into factions, for Democrats to have more than a remote chance of winning the House. And there is one more factor working against Democrats: they have become increasingly reliant upon voters, like Hispanics and those under the age of 30, who do not turn out reliably in midterm election years. Democrats have a broader coalition than Republicans do in high-turnout environments, so perhaps this will benefit them in 2016. But these are not the voters you would want to depend upon to make gains in midterm election years, when turnout is much lower.